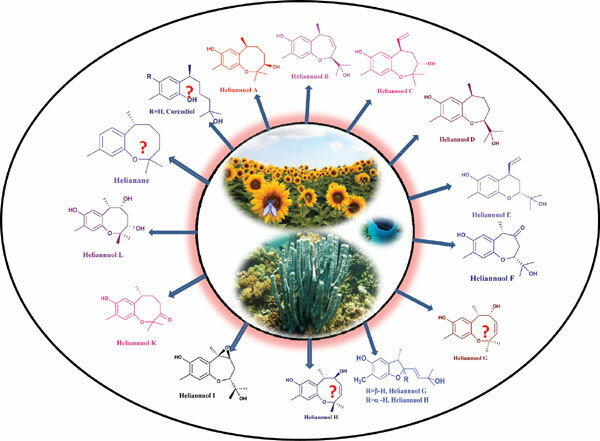 Heliannuols are a unique class of Benzoxacyclic Allelopathic Sesquiterpenes obtained from sunflowers. Allelopathy has been a keen point of interest for researchers and represents a novel but unexplored “Methodology of self-defense mechanism”. Heliannuols exhibit a varied structural pattern of five to eight fused benzoxacycles. Isolation as well as synthesis of eleven members of this group namely heliannuol A to heliannuol L has already been reported. Helianane was initially thought to be a unique member of this group containing an eight-membered benzoxocane framework. The Ring closing Metathesis (RCM) has been explored to a great extent amongst the synthetic intrigues undertaken towards this category of natural products. Recent synthetic approaches and structural studies have demanded for an amendment of helianane to curcudiol, and a tetrahydrobenzofuran ring framework for heliannuol G and H rather the earlier predicted benzoxocane ring system. Albeit, it is perceived that the underlying unexplored directions regarding the structural anomaly have been highlighted in this review. The review explains exciting synthetic intrigues, bioactivity and structural amendment and the probable perplexity of this class of novel benzoxacyclic sesquiterpenes. Heliannuols, synthesis, structural anomaly, ring-closing metathesis, benzoxacycles, tetrahydrobenzofuran ring.